At the Muskham Art Group the emphasis is on friendly sharing of interests and experience. We do all we can to make sure that there is an informative programme of events. We meet every second and fourth Tuesday at 09:45am to 12:15pm in South Muskham village hall. At some meetings we have demonstrations by visiting professional artists on various topics. So far we have a watercolour demo followed by a workshop with Stephen Coates on February 12th. The topic will be reflections. Those who can’t stay for the workshop will only be expected to pay for the demo. Our very own Alwyne Thorpe will be holding an acrylic workshop on May 16th. On 7th November Tim Fisher will be visiting us for a pastel workshop. After a very popular workshop Stephen Coates makes a return visit on Auguat 13th to give a talk on composition. When any more demonstrations or workshops have been confirmed they will be posted here – so keep checking for the latest information as the site is updated. Non-members are more than welcome to join us for demonstrations and workshops. Places are often limited for workshops so contact us early to make sure you get a place. As always it’s “first come, first served”. In 2018 on Thursday 8th February Gareth Watling made a return visit to run an acrylic bird painting workshop. April 19th saw Lynne Whitfield back again for a loose watercolour workshop. Andrew Farmer gave a still life demo in charcoal on March 13th. He alsoheld a workshop on July 5th. This was an interesting one that got a lot of people out of their comfort zones!!! On August 14th Jackie Whall was here for a demo. She painted a portrait using only five colours. On November 8th Vic Bearcroft held a workshop in pen and ink with coloured charcoal. The subject was a lion. This workshop was not to be missed as most of us had never used couloured charcoal before. In 2010 we booked Vic Bearcroft on 23rd March to show us how he uses pastels to produce a stunning American Indian. Mike Webster came on 22nd June to demonstrate how to paint a seascape in acrylics. We had our annual pilgrimage to Mike Webster‘s house on 3rd September – great painting and yummy food. We always have good weather there too! We had an all day workshop with Vic Bearcoft on 9th September which was booked because members enjoyed his demonstrations so much. On 23rd November Matthew Palmer came and give a demo on painting a winter scene using watercolours. He will be back in 2011 to give another demo or a workshop. On January 20th 2011 Vic Bearcroft held a workshop where we produced paintings of a tiger using velour paper and pastels. Tas Severis gave an acrylic workshop on 21st July and Mike Webster gave an oil workshop on September 8th. On February 28th 2012 Lynn Norris came and gave us a demo for the first time. Hopefully, this will be the first of many. April 19th saw the return of the ever popular Vic Bearcroft. He hosted an all day workshop in pastels. Our old friend Mike Webster gave a demonstration and workshop on 7th June. In 2013 Vic Bearcroft hosted a workshop on February 21st. where we will pained a bird of prey. We had a Terry Harrison workshop on May 16th, a Mick Lakin workshop on September 26th and a Liz Hayward demo on November 26th. In 2014 Gwen Scott coming to run an all day workshop in Pen and Ink on February 20th; on 10th June we invited Dave Woolass back to give a demo followed by a workshop; on 25th September we had a workshop with Tony Hogan and on 11th November Gareth Watling, the ornithological artist, was here demonstrating his amazing skills. In 2015 on April 23rd Vic Bearcroft made another welcome visit to the club to run a workshop either in pastels or pen and watercolour. On 12th May Geoffrey Herrickx showed us his amazing miniatures.On September 8th Anne Barnham demonstrated her watercolours. Liz Haywood held a watercolour workshop 19th November. In 2016 we had a workshop with Gareth Watling in Febraury and Mike Warren in April. Gareth showed us how to paint his exquisite birds. Gwen Scott came to see us again on October 27th to do a workshop in watercolours. We successfully painted a large flower in Gwen’s lovely loose style. In December Ron Freeman orgainised a paint-along session. In 2017 Vic Bearcroft makes a very welcome return visit for a pen and ink with watercolour wash workshop on February 2nd. Lynne Whitfield came for the first time to our group to give us a demonstration on March 14th. July 25th saw Vic Beacroft back again to give us a demo using cloured charcoal. On April 6th there was be an oil workshop with Jackie Whall. On November 23rd we will had a landscape workshop with Phil Biggs. Alwyne Thorpe is a long-time member of Muskham Art Group. Her enthusiasm and abilities have gained the respect of everyone there. Her interest in art started at an early age and has led to qualifications in Art and Design, and in teaching. 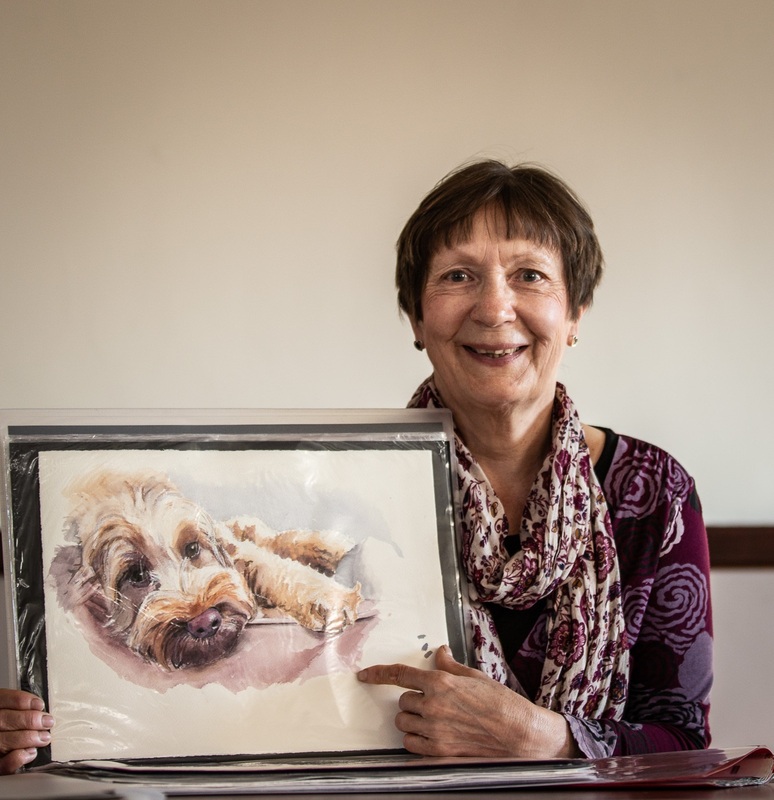 As a very active member of several art groups over the years, Alwyne has taught art, held workshops, exhibited and sold her paintings. She works in a wide range of media but especially oil, oil pastels, acrylic, watercolour and pencil. Alwyne’s qualifications, skills, breadth of knowledge and approachability make her an ideal person to offer tuition (workshops, demos, one-to-one) advice and hints and tips to other members.